Two people died on Washington state roads over the weekend. Both were killed in head-on car crashes on undivided roads. Both incidents began when one vehicle crossed over the center line and into the oncoming lane of traffic. Head-on collisions usually result from “unintentional” driving maneuvers such as taking a curve too fast, overcorrecting, becoming distracted by a passenger or cell phone, or falling asleep at the wheel. They are particularly dangerous crashes, even on fairly low-speed roads, because the force of a head-on collision is the equivalent of both of the velocities of the vehicles involved. Engineering best practice recommends that high-speed roads should be built with the intention of reducing head-on collisions, with features such as wide shoulders, rumble strips, and curvature, superelevation, and widening through the curve on horizontal curves. However, many roads in Washington state were not built with these features, making fatalities in head-on collisions an all too common occurrence. 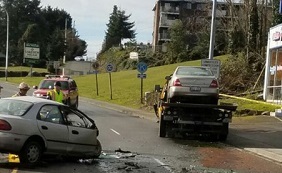 Officers from the King County Sheriff’s Office were called to the scene of a crash in Burien at approximately 9:15 am on Saturday. Witnesses at the scene had seen a Mazda sedan that was traveling northbound on Ambaum Boulevard Southwest when it crossed the center line near Southwest 128th Street. A tow truck was traveling in the southbound lane. The driver of the tow truck was unable to get out of the way in time, and the Mazda slammed into it head-on. The driver of the Mazda was pronounced dead at the scene. There were no passengers in his car. The driver of the tow truck did not report any injuries. The tow truck was carrying another car on its flatbed at the time of the crash. Officers who responded to the scene examined the driver of the tow truck and did not believe that driver was under the influence of drugs or alcohol at the time of the crash. They are not yet sure why the Mazda crossed the center line and slammed into the truck. An 18-year-old woman was killed in a crash on Sunday night when a pickup truck crossed the center line and slammed head-on into her car on Highway 101 near Raymond, Washington. The crash occurred just before 8:45 pm north of Raymond in Grays Harbor County. The woman who died was traveling in the southbound lanes of the highway in a Toyota Tercel. A Nissan pickup truck in the northbound lanes crossed the center line into the southbound lanes. The 32-year-old driver of the pickup truck and his 26-year-old passenger were both injured in the crash and were taken to a local hospital for treatment of their injuries. State Patrol officers who responded to the scene stated that they did not believe that drugs or alcohol were factors in the crash, but they are considering possible charges against the driver of the pickup truck.